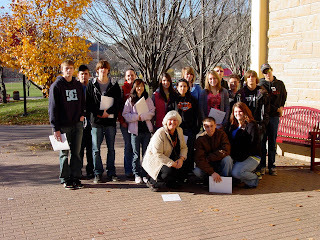 The Art and Design department was the first stop on an 'art day' tour for 15 high schoolers in Mary Weber's art classes from Alma High School, across the river in Wisconsin. The day included a visit with Brother Roderick and a discussion of the graphic design area, a look at printmaking with Preston Lawing, and a walk through the painting and drawing area with Dr. John Whelan. The group then checked on Rob McColl's two-dimensional design class before heading over to the Lillian Davis Hogan Gallery to see the exhibit on display by character designer Chris Ayers and sculptor Maureen Costa. Having taken the long way to the gallery via a pleasant autumn walk along Gilmore Creek the students worked up quite an appetite. They finished off their visit to SMU with a gallant attempt to overwhelm the soft serve ice cream machine in the caf. We hope with such a big tour topped off with so many calories they still had some energy left for their next destination, the Minnesota Marine Art Museum.